Mike Ainscoe reviews the new album by Heath Common – songwriter, lyricist, poet and former Melody Maker and Guardian music journalist. Heath Common. Not the settlement in West Sussex but the man for whom it seems a shame not to roll out the marvellous quote from the Congleton Chronicle : “What Jack Kerouac would sound like if he came from Manchester” – the songwriter / poet / performance artist is nothing less than a phenomenon who should be required listening as an example of a sprawling imagination and sheer originality. His ‘The Dream Of Miss Dee’ debut album was a rambling odyssey of words and music including references to beat poets, zen as well as the lovely diversion which is ‘Manchester Summertime’, and the album which introduced the world to Heath Common. He’s now back for more and this time with his own band who provide the backing to accompany his musings. As you can expect from Heath Common, he picks up on all sorts of characters to populate his thoughts and match the atypical musical arrangements in his songs. There are reflections on the death of Hendrix, the legacy of John Lennon and he explores the exploits of the notorious jail breaker, Ray ‘the Cat’ Jones, the latter a diatribe set against a jazzy background which verges on musical theatre. Not one to take time for introductions, within half a minute of the opening track ‘Icarus’ the impression is set that you’re going to be taken on a flight of fancy to a place that’s somewhere that little bit bizarre and outlandish. The spoken word lyric makes his Northern roots quite clear while referencing Jimi Hendrix, Ronnie Scott’s and Soho Square before breaking into a jazzy rock instrumental and low mixed female wailing in a cross between ‘The Great Gig In The Sky’ and a Twilight Zone soundtrack. ‘Angeline Albertine’ immediately follows and drifts into a French musical vibe, a common thread throughout the album, with a lyric of seduction into the exotic. Elsewhere, in ‘Reflections On Francis’ he talks of being frightened about what he might find if he excavated his memory; whether or not it’s autobiographical it’s an apt comment on what must be going on in his mind. Same in a line from ‘Lenny Bruce : “Don’t judge me until after tomorrow, or maybe some time after I’ve died” – perhaps a tongue in cheek anticipation that his genius will go unrecognised and unsung until he’s been a long time gone. Or maybe just a slight dig that this is art with which you have to invest some time and thought. All the while there’s the development of a distinctly Mediterranean musical feel yet all sorts of influences pop in. When you wonder what the connection is during ‘Lennon’, there’s suddenly a reference to Candlestick Park and ‘Love Me Do’ incorporated into the smoky backing. Pick of the tracks? Probably the dreamy ‘Women Of Lincoln’ where the pastoral flute episode develops into the sort of guitar/vocal thing which you might have found latter day Pink Floyd/Roger Waters doing, before the folk ambience and the inevitable accordion kicks in again. 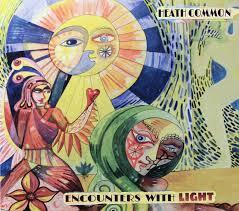 Once again, Heath Common has created another alternative world of seemingly random, yet more likely well thought out meditations, all accompanied by a soundtrack which adds to the unorthodox nature of his musical philosophy. Beat poet, performance artist – whatever you want to call him, there’s the essence that he’s a writer of originality who treats his words as one ingredient in a recipe which combines music and a healthy portion of Northern adorned observations in a unique mix. You can find Heath Common online here: heathcommon.com. He is also on Facebook and tweets as @Heathcommon.